Meigs senior Marissa Noble (8) attempts a spike over Southern junior Phoenix Cleland (6) during the Lady Marauders’ non-conference victory on Tuesday night in Racine, Ohio. Southern junior libero Kassie Barton hits the ball over the net, during the Lady Tornadoes’ five-game loss to Meigs on Tuesday in Racine, Ohio. RACINE, Ohio — Starting off in style. 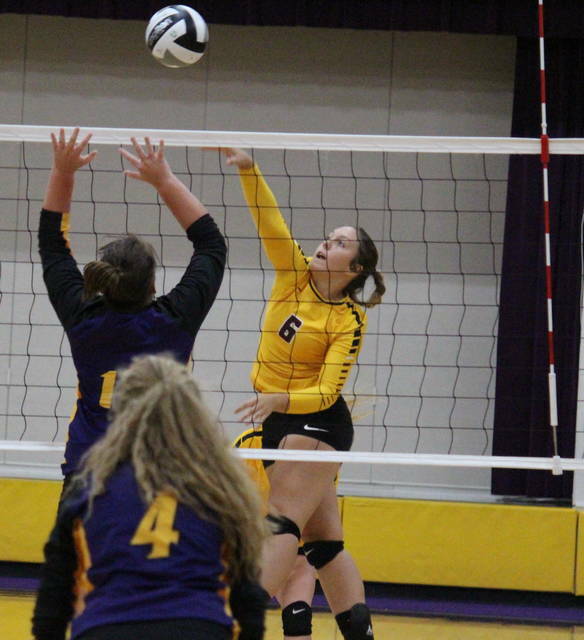 The Meigs and Southern volleyball teams battled through five games in Tuesday’s non-conference match, and the visiting Lady Marauders pulled off the victory in the deciding game of the season opener for both squads. The opening game of the evening featured a trio of early lead changes before Meigs (1-0) pulled out to a seven-point advantage, at 12-5. The guests stretched their first game lead to as high as eight, at 15-7, but Southern (0-1) fought back to tie the game at 22. Meigs went ahead 23-22, but the Lady Tornadoes scored the next point to tie the game again. However, the Lady Marauders survived the storm, scoring the next two points to take a 1-0 advantage in the match. In the second game, Meigs scored the first five points and led by as many as eight, at 13-5. The Purple and Gold tied the game at 15, and again at 16, before taking their first advantage at 17-16. Meigs tied the game five times, but never regained the edge, as Southern evened the match at 1-1 with a 25-23 victory of its own. 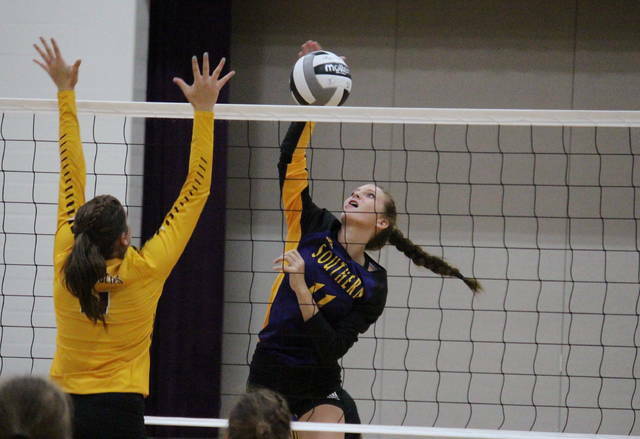 The Lady Marauders never trailed in the third game, fighting through just two ties on their way to a 25-12 triumph. MHS led initially in the fourth game, but Southern took the lead at 6-5 and never trailed again. SHS led by as many as eight points in the fourth, ultimately winning the game by a 25-20 count to tie the match at 2-2. In the deciding game, Southern held early leads of 4-1 and 8-4, but Meigs fought back to take the advantage at 9-8. The Lady Marauders surrendered the next two points, but then scored two of their own to regain the lead at 11-10. Southern tied the game at 11, but Meigs earned the next four points, giving the guests a 15-11 win and a 3-2 victory in the match. Following the triumph, second-year MHS had coach Lea Ann King was delighted at the 1-0 start to the year. Third-year SHS head coach Kim Hupp was proud of the fight her team showed, and also acknowledged her club must work on the mental part of the game. “The girls made some great hustle plays to get the momentum going for us,” Hupp said. “We had some nice plays at the net and kills to keep the serve on our side. As a team, the Lady Marauders had a serving percentage of 89.9, and a hitting percentage of 12.7. Meanwhile, Southern had a serving percentage of 89.6, and a hitting percentage of 5.6. 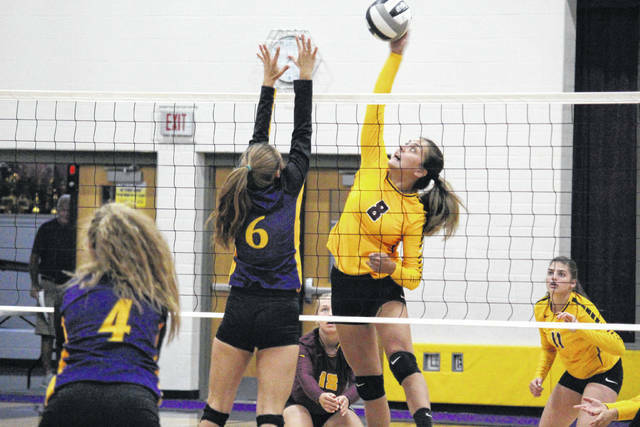 Meigs was led by senior Marissa Noble, who posted match-highs of 18 service points and eight aces. Libero Breanna Zirkle had 14 points for the victors, while Hannah Durst and Baylee Tracy each had eight points, with Durst earning three aces. Senior Madison Fields had four points in the win, while MHS freshman Mallory Hawley finished with one point in her debut. Southern’s service attack was led by Baylee Grueser and Peyton Anderson with 10 points apiece, including five and two aces respectively. 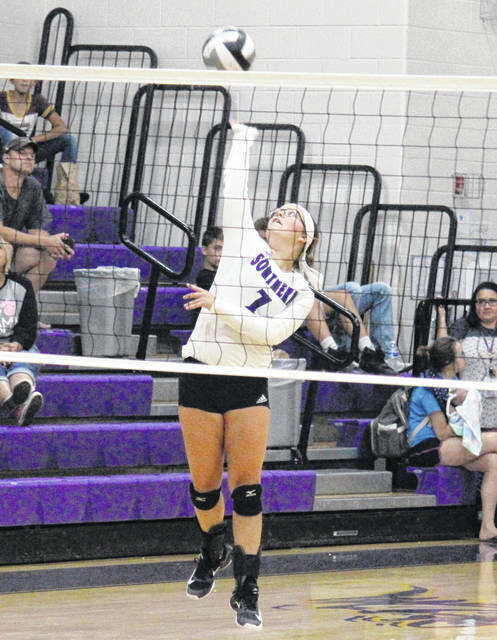 Libero Kassie Barton had eight points and a pair of aces, Phoenix Cleland chipped in with seven points, while Marissa Brooker finished with five. Baylee Wolfe contributed four points and one ace to the Lady Tornado cause. Hawley led Meigs at the net with 14 kills and three blocks. Durst finished with 13 kills and 6.5 blocks, while Noble had 11 kills and 9.5 blocks. Maci Hood had two kills in the win, Zirkle and Tracy each added one, while Fields had a match-best 32 assists. The Lady Tornado net attack was led by Wolfe 11 kills. Jordan Hardwick chipped in with five kills and two blocks, Phoenix Cleland added three kills and five blocks, while Mickenzie Ferrell came up with three kills. Barton, Brooker and Shelby Cleland each had one kill in the setback, with Brooker earning a team-best 24 assists. These teams are set to meet again as part of a tri-match on Sept. 8 at MHS. Meigs will be on its home court for the first time on Wednesday against Eastern. Southern will be back in action on Monday when it hosts River Valley.